Each of these five types of True-Fit™ Tips -- color coded as orange, red, black, blue, and green -- has a distinct profile, offering a unique combination of length and diameter. That makes Westone True-Fit™ Tips perfect for anyone seeking the best fit possible from an off-the-shelf (aka "universal fit") earphone tip. These foam earphone tips are as close as you can get to a true custom fit without actually moving up to professional lab custom molds for your earphones (which are significantly more expensive!). True-Fit™ Tips are made to the exacting, high-quality standards you expect from an industry leader such as Westone. These foam tips are made of plush, medium-recovery foam that strikes a great balance between quick and easy insertion and long-term comfort. Another feature that sets these foam earphone tips apart from the rest is that each ear tip has a smooth surface and a rounded ergonomic shape to maximize comfort and reduce ear fatigue. With their smooth design and high-quality foam, True-Fit™ tips can help keep your earphones in place securely and comfortably, and with a good acoustic seal so you can experience the very best sound quality your earphones or in-ear monitors have to offer. 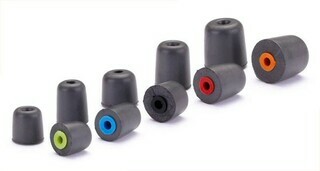 This high-quality construction, paired with 5 distinct and intelligent size profiles to choose from, makes Westone True-Fit™ Tips one of the very best choices available for replacing your earphone tips, providing the benefits of an affordable near-custom fit and making your earphones or in-ear monitors comfortable enough for serious all-day wear. If you prefer a silicone tip over a foam tip, see Westone's STAR Tips™ here. Tip: Not sure which True-Fit™ Tip size you need? Check out our True-Fit™ Tip Combo Pack, which contains one pair of each size of tips so you can find the perfect True-Fit™ Tip to fit your unique ears.